Luther, right, administers The Lord’s Supper serving both the bread and the wine, a practise based upon Scripture. What has the Church meant when it speaks of the “catholicity” of the Church, or when it speaks of “one holy catholic and apostolic church”? The word “catholic” is derived from a Greek term which means “according to wholeness.” That which is “catholic” is that which relates to the whole Church throughout all space and time, and pertains to the teaching God has given the Church to announce and the means by which God builds and grows His One Church. Since we as Lutherans declare that what we believe, teach, and confess is nothing other than that which is to be believed always, everywhere, and by all, we legitimately consider ourselves to be truly “catholic,” and should not be afraid of the term. One of the distinguishing marks between Lutherans and other church bodies who deem themselves “Protestant” is in our understanding of those ordinances from God which are referred to as “sacraments.” Most Protestants—those that follow the teachings set forth by John Calvin or Ulrich Zwingli—see those ordinances as commands of God which are to be obeyed simply because God has commanded them. They understand them to be public witnesses to our faith, but not means of grace. One complaint that they make about Lutherans is that Luther and his followers “did not go far enough” in their reformation of the Church, especially since they continued to proclaim that the sacraments were Christ’s work for and in His Church and not human works that demonstrate our faith. When at the time of the Reformation the emperor and the pope declared the “Lutherans” to be guilty of all forms of heresy, the leading theologians and princes of the Lutheran Church prepared and signed the Augsburg Confession in order to demonstrate that their teachings conformed to what the Church had taught from the beginning. 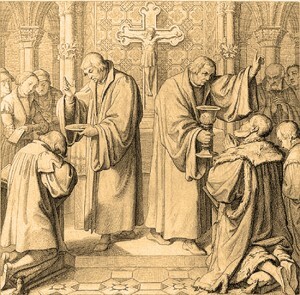 They recognized (and declared) that the true unity (catholicity) of the Church consisted in the right proclamation of the Gospel in all its articles and the administration of the sacraments according to Christ’s institution (see Article VII of the Augsburg Confession). Thus the Church transcends denominational boundaries and shows itself to be a fellowship of faith. The Augsburg Confession then went on to describe the truly “catholic” (universal) understanding of the sacraments. The Lutheran party emphasized their continuity with the church from the apostolic era onward, and retained the traditions of the church with the exception of those things that contradict the Gospel. Other Protestant groups, by contrast, saw the purpose of the Reformation to be the task of returning the church to the apostolic era as they understood it, rejecting anything that was not explicitly commanded by Christ, including such things as vestments, music, and art. The Lutheran party pointed to the true unity of the church in AC VII as the right preaching of the Gospel and proper administration of the Sacraments. This was the basis of the disagreement with Rome. Rome had gotten off track, they said, by first of all saying that the sacraments worked and had benefit for the person simply by the performance of the act, even apart from the faith of the recipient. In this view, the sacraments are the means, that is the power, which gives the individual the ability to move forward toward salvation—working out their salvation through the power of grace infused into the individual. The Church, then, is not composed of those who are saved, but of those who are working out their salvation. For Rome the sacraments do not convey the forgiveness of sins in its fullness. Each sacrament, then, gives something that the others don’t. Baptism, for Rome, forgives sins up to the point of baptism, but other sins can be forgiven only through the sacrament of penance. Confirmation becomes the means by which the Holy Spirit is further given to the individual to work harder in order to gain more merit before God. The Augsburg Confession sees this understanding as an abuse of the gift given by God in all of the sacraments, namely, the forgiveness of sins. Rome (and Eastern Orthodoxy as well) insists on seven sacraments, each having something not present in the others. The Lutheran Confessions, in the Apology of the Augsburg Confession XIII, note agreement between Lutherans and Rome in that the sacraments are not simply marks of profession among people (the Calvinist and Zwinglian position), but that they are also signs and testimonies of God’s will toward us through which God moves hearts to believe (AC XIII:1-2). Yet the Lutherans Confessors refuse to enumerate the sacraments, while Rome and the East insist that there are seven. Things are further complicated by the fact that the term “mysteries” (Latin “sacraments”) used by St. Paul in 1 Corinthians 4:1 is not defined. In order to point to their origin with God, as acts performed by God, the Confessors define them as rites which have the command of God to which the promise of grace has been added. Thus the Apology lists the “sacraments” as Baptism, the Lord’s Supper, and Holy Absolution (ie, the pronouncement of God’s forgiveness to repentant sinners). The promise of forgiveness, won for every one of us on the cross, is given to each of us through the Gospel and the sacraments. Some readers will be surprised to see absolution called a sacrament here. In fact, the Lutheran Confessions allow for a number of rites to be called “sacraments,” depending on the definition in use at any given time. The primary definition of “sacrament” focuses on Baptism and the Lord’s Supper, which are unique in that they attach the promise of forgiveness to a visible sign. But in a broader definition of the word, we can also call Holy Absolution a sacrament. All three of these rites—Baptism, the Lord’s Supper, and Holy Absolution—were instituted by Christ and grant the gift of the forgiveness of sins. (See John 20:22-23 where Christ institutes the Office of the Keys and connects the promise and gift of forgiveness to Holy Absolution). In a way, it could be said that the Confessions are in fact more catholic that either the Roman Catholics and the Eastern Orthodox! The Eastern Orthodox see the necessity of completing baptism with the rite of chrismation, the use of holy oil which they say serves as the seal of the Holy Spirit. Roman Catholics see the sacrament of confirmation as a further step in the Christian life that adds grace to the grace given in baptism, and they see the sacrament of penance as necessary to forgive sins committed after baptism and to remit time in purgatory. The Lutheran Confessors instead rightly see repentance and absolution as a return to one’s baptism (see Large Catechism IV:77-82 and the Brief Exhortation to Confession). It is important to see baptism for what Christ and His apostles say it is: something done to us and for us for the forgiveness of sins. Since it is God’s act and not ours, we can trust Christ’s promises concerning it. To turn it into a human work creates the impression that our obedience in some way justifies us before God. To say, “I have been baptized,” is a word of Gospel, a word of consolation, to the troubled sinner, which gives assurance that God has made that sinner His own and has given them new life. Without that clear word of promise the individual is forced to look within for assurance. We cling to baptism because of Christ’s promises attached to it, not because the act of being baptized somehow justifies us before God. So also the Lord’s Supper is to be taken at Christ’s word, that there He gives each of us His true body and blood for the forgiveness of sins, for life, and for salvation. Eastern Orthodoxy and Roman Catholicism both recognize that Christ gives His body and blood in the Sacrament, but both speak about a “change” from bread and wine into Christ’s body and blood, language that the Confessors avoid, preferring simply to accept Christ’s words that in the Lord’s Supper the bread and the wine are His body and blood. Eastern Orthodoxy puts its focus on healing and transformation of the individual, which is not wrong in and of itself, but the Confessors emphasize that all other gifts we receive in the Sacrament are founded upon the gift of the forgiveness of sins. So also, in contrast to Rome and the East, the Confessors recognize that the sacrament (or rite) of repentance (penance) has its focus on the word of absolution, which is to be pronounced unconditionally. Acts of restitution and reconciliation between Christians or with the Christian and the world come as a result of absolution and are not to be seen as requirements that merit the pronouncement of forgiveness. Most important with all three is the fact that they all emphasize the “for you” nature of the Gospel. That “for you” shows that what has been instituted generally is distributed specifically to each individual, making them Christian and sustaining them in the faith. It is those words which require faith, but also serve as the object that faith clings to, not as something outside of Christ, but because that is where Christ has promised to meet us. That promise of forgiveness, won for every one of us on the cross, is given to each of us through the Gospel and the sacraments as Christ says, “This is for you.” And that is a promise worth clinging to!